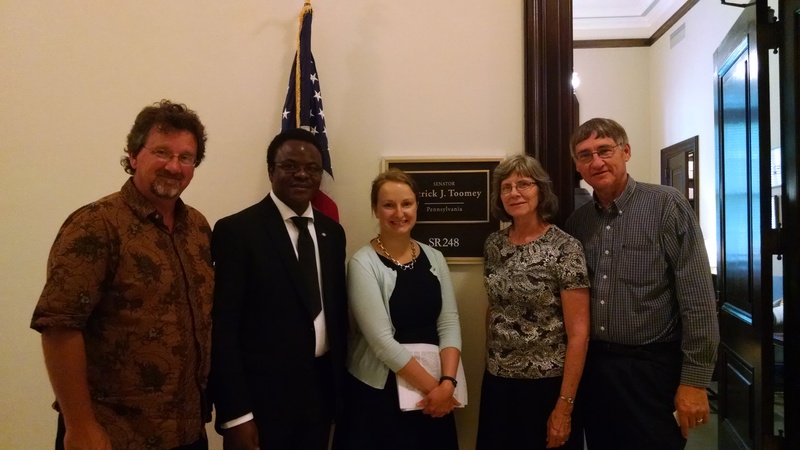 Katherine Cessar (center), staff for Sen. Toomey (R-Pa.), met with MCC staff (left to right) Luke Schrock-Hurst, Charles Kwuelum and Laura and Ken Litwiller about the Food for Peace Reform Act. In February 2015 the Food for Peace Reform Act was reintroduced in Congress. The bill proposes to reform U.S. food aid so that funds can be used more efficiently and therefore reach far more people in need. The bill would allow food aid from the U.S. to be produced and purchased near the communities receiving aid, change restrictions on shipping that cost time and money, and remove the policy of “monetization,” which causes the loss of 25 cents of every dollar and is damaging to local markets. With these changes, it is estimated that the bill could free $440 million annually, impacting an additional 8 million to 12 million people. One in nine, or 805 million, people suffer from chronic hunger and malnutrition today.